toys | How can I recycle this? 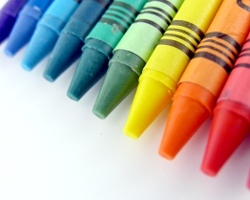 I want to melt old crayon stubs together to make new crayons for kids. I know I could use old muffin tins or ice cube trays, neither of which I have, but I was wanting them in a little more interesting shapes. I’ve seen them made in candy molds, but again, I don’t have any. Any ideas? A lot of the soup mould ideas we had resulted in practical rather than interesting shapes – but I’m sure there are interesting shaped potential moulds out there too :) I’d look to kid-related packaging – sweet (candy) packaging or toy packaging which is formed plastic around a shape. With Easter coming up, there might be a few egg or bunny shapes floating around for reuse. Another idea might be to make your own moulds: I suspect Danell doesn’t have all the time in the world for carving intricate shapes but — and this is a complete I-have-no-knowledge-about-this suggestion — could they be made from something like salt dough? Could you make a sheet of salt dough in a baking tray and press fun shapes into it – again toys or magnetic letters – then varnish it to use as a mould? Please feel free to correct me if that wouldn’t work! One thing to remember – there needs to be a balance between interesting shapes and usability. I’ve seen some new crayons made in star shaped moulds but I imagine the pointy bits would hurt small hands and be a bit awkward to hold too. Any other ideas? What have you used for interesting shaped moulds — whether for crayons, soap or sweets? Have you made your own moulds from anything in particular? 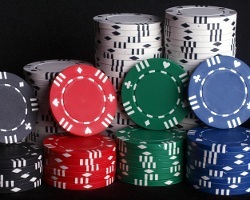 How can I reuse or recycle poker/betting chips? Hi! I’ve found a lot of chips to bet, and I wonder if anyone has some use for them. There was a fad for playing poker with betting chips a few years ago and all the shops were stacked full of them as cheap/easy Christmas presents – so I bet (ha!) there are lots of unwanted ones lying around people’s houses. As is just about always the case, the first suggestion should be to pass them on if you can: gift them to a charity/thrift/op shops or jumble sale, or sell them yourself at a car boot sale/garage sale. If the set is too depleted for that, I’ve seen them used for various little craft projects – turned into keyring fobs or wine glass charms, or for smaller ones, used to make fun costume jewellery (drop earrings, necklace pendants, or even oversized ring decorations). For bigger projects, I’ve seen basic coffee tables customised with dominoes or Scrabble tiles – I wonder if betting chips could be used in the same way… They could certainly be used to decorate photo frames or other items for a poker/betting fan. I’d probably throw a couple into our tool box just in case I ever needed something like these plastic discs but I’m not sure what I’d use them for – perhaps, if they were thin enough to open cans of paint (a painter I used to work with recommended using 2pence coins instead of screwdrivers so I’m extrapolating from that), or instead of bits of paper to level up wobbly furniture. Has anyone else got any crafty reuse/upcycling ideas? What about other practical suggestions? 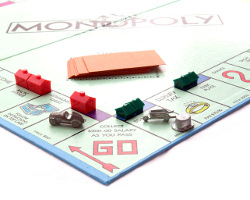 How can I reuse, recycle or pass on old board games? We’ve got lots of board games (Monopoly and such) from when the kids were little but they’re not in good condition so I don’t think charity shops will take them. What else can I do with them? As long as they’ve still got all/enough pieces, games like that don’t need to be in pristine condition to be fun. Perhaps offer them honestly on your local Freecycle/Freegle group – someone might just be grateful to have them whatever the condition, especially if they’re going to be playing with similar destructive kids ;) Or someone might want them for “spares and repairs”, or to make things out of the game pieces. Any other suggestions for Harrie? What have you done with old board games? 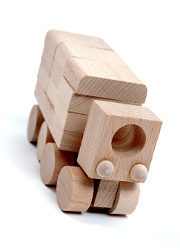 How can I reuse or recycle parts of wooden toys? Cleaning out my boys toy box before Christmas, found lots of pieces of wooden toys from when they were little, sorting blocks, building blocks that sort of thing. Tried to get them into original sets to give away but either too many pieces missing or just not knowing what goes with what. Nice colours and shapes, shame to bin them. I can understand the desire to declutter before Christmas but don’t underestimate the value of random bits & pieces for future imaginative play potential – I remember having random bits of pre-school toys around until I was at least 10, using them as assorted markers or objects, reinventing them in different ways to fit the purpose. The toys will likely to have been painted or varnished so shouldn’t really be burnt or composted and I suspect to be safe for little ones, they’ll be quite chunky – possibly too big for upcycling into fun costume jewellery. They might make a mobile or a decorative door hanger for a nursery though. Green Halloween: How can I reuse or recycle Halloween decorations? Along with masks and costumes, the shops are full of Halloween decorations at the moment too. Plastic skulls & skeletons, plastic pumpkins, plastic spiders & bats, plastic ghosts & ghouls … lots of plastic. As with the masks, it’s far greener (and more fun!) to make decorations from scratch rather than relying on stuff that’s mass produced on the other side of the world. There are loads of make your own Halloween decorations how-tos out there (for example, these ten different ideas…). But still, lots of people turn to shop bought stuff. Any suggestions for ways to reuse or recycle these bits and bobs? Plastic pumpkin/cauldron plant pots? Or how to repurpose/upcycle things to use them all year around – as decorations or for other purposes? 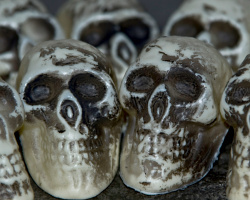 One idea I saw was using skull ice cube trays as soap moulds – while they intend the finished article to be a Halloween party favour/trick or treat gift, why restrict the fun to just this event? I say fun skull soaps all year around! Another idea for a bigger, harder plastic skull – drill/poke pencil size holes around the cranium and use it as a fun pen/pencil pot – like Pinhead from the Hellraiser films, but with brightly coloured felt tips. Anyone using Halloween decorations or party favours to make spooky costume jewellery?